← Think Pink For Breast Cancer Awareness! 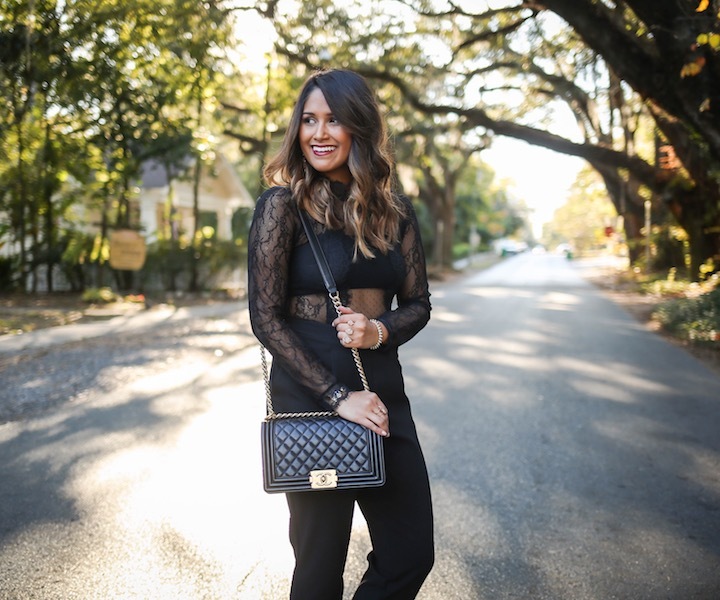 Happy Friday everyone, today I’m sharing a chic, holiday party look with Express featuring this stunning black lace jumpsuit! However, you don’t want to waste this gorgeous jumpsuit on just an holiday party, it’s meant for something special like your husband’s work Christmas party or maybe you’re planning on hosting your own holiday soirée this season. You could even save it for a fancy girls’ night out or who knows maybe buying this jumpsuit will inspire you to plan something fun if you don’t already have some place in mind to where it to. I plan on wearing this jumpsuit for Thanksgiving Eve. You might be wondering what exactly that is, but if you’re hometown is anything like mine, then every year on the night before Thanksgiving Day, you get dressed up and go out to local bars with all your friends knowing that you’ll practically see everyone you ever knew from high school. It’s basically like a giant high school reunion so you obviously want to look your best! Not only is this jumpsuit uber chic, but it’s also great because it barely requires any styling! All you need is a simple pair of ankle strap heels or pumps and some statement earrings! If you’re not a jumpsuit girl, but you love this lace look, you’ll be happy to know that it also comes in this beautiful mock neck dress! Jumpsuit Sizing Reference: I am about 5 ft tall, sz 34b and I got the size 2 in the jumpsuit and it fits perfectly. However, I did get the pants hemmed about a half inch so that you could see more of my heels! Makeup: I’m wearing Urban Decay Vice Lipstick in Manic (also available here)! This post is in partnership with Express, a brand I love. All opinions and selections here are my own. Thank you for supporting the affiliate posts who make this blog possible.